After reading Ignore Everybody by Hugh MacLeod, I subscribed to his gapingvoid daily cartoon emails. Saw this one recently about job security. Stuff happens. Budgets get cut. Companies and organizations close down. Pink slips are given out. 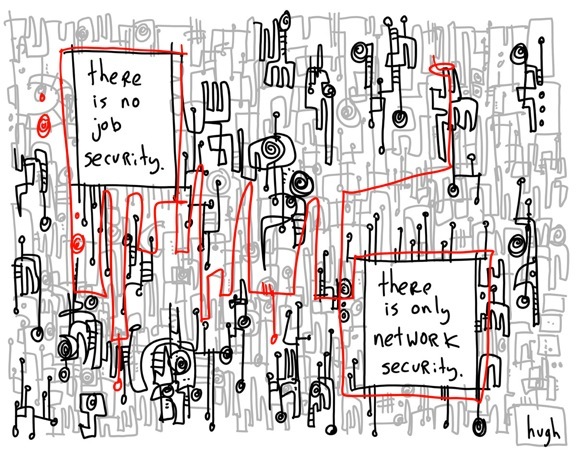 The secret to job security: there is no job security. At the end of the day, it’s about your skills, knowledge and experience. It’s also about people – who you know and who knows you. It’s about your network. A colleague told us she landed a job through a connection on LinkedIn, shortly after an informational interview with someone from the organization of interest. Someone contacted me about a potential job opportunity through a conference program proposal that I had submitted.